I’m at my parents’ house at the moment, horse-sitting while they’re away for a few days and providing my services as a house-painter. Before I left for here, though, Dan and I made a couple of MAPS visits to two of our sites. Quiet, quiet days, despite a fair bit of activity at Rock Ridge the last time we were there. It’s hard to know if dispersal is low due to poor breeding success this year or if we’ve just hit on a couple of poor days… we’re hoping the latter. On our way out of the site at the end of our Rock Ridge visit I was waiting for Dan to finish wrestling with the canoe when a large insect buzzed in and landed on a twig not far from me. It turned out to be a cicada. I had my short lens on the camera and wasn’t able to get close enough for a shot suitable for making an ID with, unfortunately, but it’s an annual cicada of some species. Perhaps a dog-day cicada, like the one I discovered emerging from its larval exoskeleton a few years ago. Ordinarily these guys are pretty tough to spot as they hang on branches in the tree canopy and their loud buzz can be difficult to zero in on, so it was neat that this one was down at ground-level and easy to see, even if it flew off when I tried to step a bit closer. It feels, so far, like it’s been a good year for cicadas, as I’ve spotted quite a few of them. I wonder if their numbers actually are higher this year, and if so, whether that’s due to particular conditions of this year, or of the year that this year’s adults had been laid as eggs (they can spend two or three years in their larval stage before emerging from the soil to metamorphose into an adult). 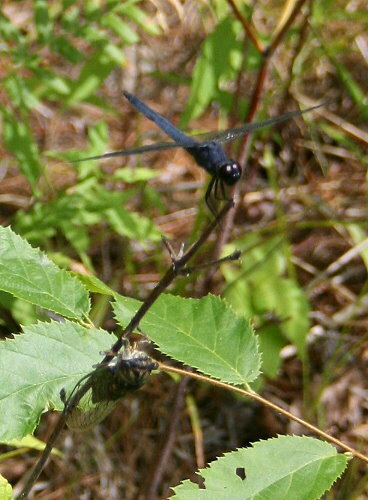 As I was pulling my camera out, another insect came and perched on the same twig: a Slaty Skimmer, Libellula incesta. This individual or another nearby had actually scooped a deerfly from about my head and landed on my canoe paddle to eat it only moments earlier (which I find an interesting coincidence, as my only other photo of this species happens to be of an individual chowing down on a deerfly caught from around my head). Slaty Skimmers are one of my favourite dragonflies for that deep, velvet blue. I’d never noticed them where I grew up, and I haven’t spotted any at our current place, but they’re possibly the most common species at Rock Ridge right now. I think they may be my favorite too, if they eat deer flies! love your title.